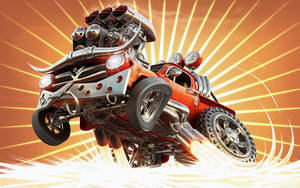 Featured by PixelTango, in Beautiful Examples of Vehicular Graphics Artworks. Very nice, I love how haphazard it looks. I'm not sure what this is either, but it is wicked and I really like it. I'd buy one. That is one amazing machine. Awsome work and super cool vehicule. very original, I'd love to have one!!! Cool. I wanna drive one! Yee aagghh ! Fantastic image, love it !! Very cool design. The real problem is that you've got the exhaust gases coming out of the compressor/fan (inlet) end of the engines - would typically mean a pretty significant failure. Still pretty damn cool design. wow. its genius! very nice job! hehe it needs more thrust. Say, the thrusters from a space shuttle? This thing would be so awesome if it was real. I'd buy it. Yeah max downforce with those babies lol I want one! "Even though I don't understand why the thrusters are facing downward, you can't help but to think that this is so, so cool." -to make sure it stays on the ground!, duh! amazing, the original reminds me of fallout 3 scenery, really nice feeling transcends from it, well done! Now that's the Big Wheel from hell!